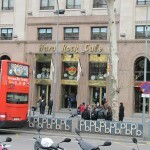 As in all other major cities around in Europe like Budapest and Prague, Hard Rock Cafe can also be found in Barcelona. 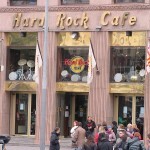 Located in the end of La Rambla, at Placa Catalunya visitors can grab a bite of real American food at Hard Rock Cafe. The price level is okay, and this is a safe bet for those fed up with seafood or tapas! In Hard Rock Cafe you will get some of the best hamburgers in Barcelona, and you can of course buy all the typical Hard Rock Cafe souvenirs worth bringing home after your stay in Barcelona. I am taking a cruise from Barcelona and would like to stop in at the hard rock before we depart. How far is it from the cruise terminal. someone also mentioned la sagrada familia is that near the hard rock. Thank you. The distance from the cruise terminal to Hard Rock Cafe is about 4km. It is though a nice walk through some of the most important areas in Barcelona. The Hard Rock Cafe is locaed at Plaza Catalunya, and the walking distance from there to Sagrada Familia is about 2,5km!